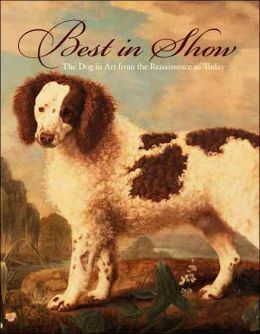 A few years ago, I acquired a book called Best in Show, The Dog in Art from the Renaissance to Today. As an art lover and a dog lover, it kind of feels like someone compiled the book just for me. I inherited the book from my friends’ neighbor who passed away, in fact, she’d killed herself. I met the woman only once. My friends had a party and they had invited their neighbor, I’ll call her Cathy. Cathy and I talked and I told her I was a dog lover. She asked if I wanted to meet her five dogs. Yes, please! So we went across the hall to her one bedroom apartment that had magazines and books piled everywhere and five happy, energetic dogs greeted me. A couple were on the older side. There was much licking and tail wagging, from the dogs, too. We sat in her living room and talked about our dogs and what a joy they were. Then we went back to the party. A couple years later, my friends told me that Cathy had died, she’d committed suicide. And later, when they were helping Cathy’s best friend go through Cathy’s things, they found this book and wondered if I’d like to have it. Of course, I said yes. And now, whenever I look at this book it means something to me on a few levels. I love art books. And I love looking at pictures of dogs. Dogs have always figured prominently in my life, from my first dog, Pee Wee through Buford Jake and then Lucy and Mandy and then Millie and Ricky. They have brought me so much joy. And I’ve always been a person who leans toward depression. More so when I was younger, but even now, there are days or nights when I take to my bed and crawl into a ball and I love when my pets burrow beside me, offering their comfort. So I look at this book sometimes and think about Cathy and even though I know she ultimately decided to end her life, I’m sure those five dogs were a necessity. They probably kept her tethered to this world longer than if she had not had them. I also often find myself thinking about legacies. If your children are human, you hope that once you are gone, your children and grandchildren will say that you lived, that you mattered, that you illuminated. When your children have four legs, they can be many things, but they can’t be your advocate after you’ve gone. So, that’s why I’m writing this. About this book and about art and about dogs, but also about Cathy. She lived, she mattered and she illuminated. And I hope someday, someone might say the same thing about me, too. Love this story! Thanks for sharing a second time. You know how to make your mom laugh and cry in the story. Don’t worry your four legged family lives today and they know your love.